I sold my house!! ?? Immediately, people began speculating why he sold his house and where he might be going next. 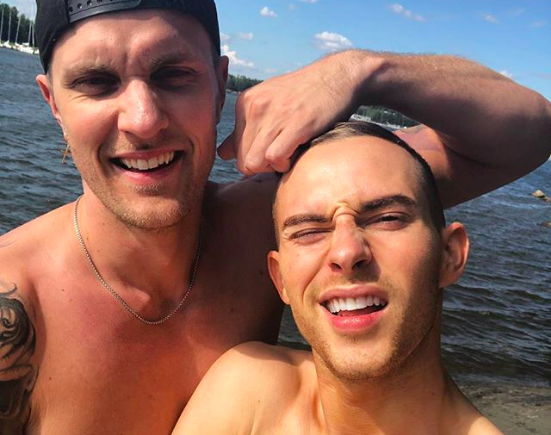 “Are you and @adaripp moving in together?” someone asked. “Yep JP, moving to LA soon,” another person commented. “Yassss daddy’s moving to LA soon,” someone else wrote. “Congratulations JP!! I hope this is one step closer to making your dreams come true,” a fourth person said. Adam first revealed he had a boyfriend back in April. In May, he told Extra things had gotten “serious” between the two of them and that Jussi-Pekka was considering a move from Finland to Los Angeles so they could be closer together. Well, it looks like that big international move is finally happening! We’re super excited for the guys! Really in all honesty “who cares”?? isn’t a story it’s just gossip and bad gossip at that! Exactly, who gives a phuck Graham? As I’ve said so many times, I can’t believe the staff here consider themselves writers. So Adam is moving in with his boyfriend, Gus Kenworthy adopted a dog. Honestly I can only imagine how vapid it would be like on a date with Graham or David. It’d be as cringeworthy as doing blow and listening to anything Andy Cohen had to say. Graham and David make US Weekly look like Vanity Fair. Sorry they been dating less than 6 months. This guy sold house change country to move in?? Am all for happy endings and admire Adam for being so open and a role model for Gay athletes. Seems like someone is rushing things a bit….